We had quite the adventure getting from Winchester to Kamiah. I had read in our RV Resort book to avoid Highway 64, but because we were using a paper map that didn’t even show Highway 64 and a new, unfamiliar GPS, unfortunately, that was exactly where we ended up, on Highway 64 … It was a 7 mile, high mountain, switch-back, descent on a very decent gravel road. It would have been just fine in our truck, but in our truck pulling our 38 foot trailer….not so great. Randy says we were never in danger but I was definitely uncomfortable and I am not easily spooked. Once we arrived, all has been well. We were able to get our forwarded mail for the first time. We called the UPS store that is now our mailing address and had them send it, and they did. It worked! We are in a private campground that needs some TLC but it has a cold pool, a warm hot-tub and full hook-ups for our membership price of $10 per night. After a week of just water and electric, it is nice to have the sewer connection to be able to do laundry. We have this cute little washer/dryer combo that takes in dirty clothes and about 3 hours later produces clean, dry clothes. Somehow it dries by using hot water. I don’t get it at all, but it works. This RV park has some large beautiful trees but we opted to be on the street side edge to be able to use our satellite TV. I am glad for the satellite since it has mostly rained since we got here. During breaks in the rain we have taken Elko across the street to walk around the “Heart of the Monster.” This is part of the Nez Perce creation story and included in the area’s Nez Perce National Historical Park. 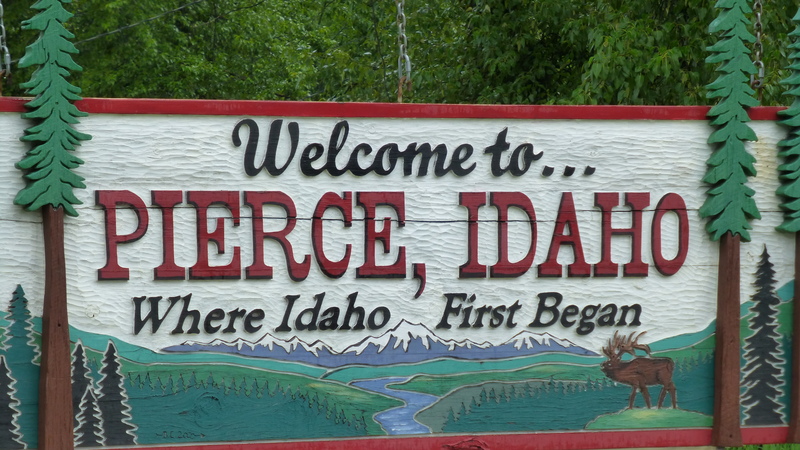 Yesterday we took a drive up into the mountains and saw some beautiful scenery and went to Pierce “the oldest town in Idaho”. 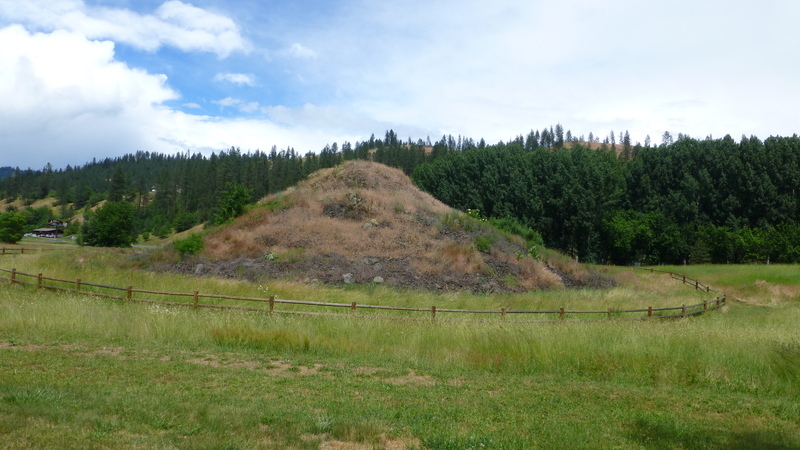 Since I had previously learned that Franklin, settled by Mormon pioneers just north of the Utah border, was the oldest town in Idaho, that took some researching. Apparently Pierce had that designation for many years but more recently, Franklin was given that distinction by a few months. Pierce hasn’t changed their signs or their visitor information. Today we went to Faith Lutheran Church in Kamiah. It is a small congregation, maybe 30 people in attendance, but was most welcoming. They had a welcome gift, a crochet dish cloth and wooden spadel, and we were the first visitors to ever receive them. As they use the “red hymnal” instead of the “green hymnal” that we were familiar with from our Lutheran days, we were occasionally lost, but it was good worship nonetheless. There is a Orofino creek thats looks like it runs close by. I bet its really scenic up there. We went through the town of Orifino today enroute to our new “home” of Dworshack State Park. It was another interesting road in, switchbacks and steep grades, but at least we were suppose to be there this time! It is a nice campground and we are able to get satellite so, after lunch and a walk, we have been watching World Cup and the Mariners. Should be a great few days! Only downside is no cell service. Have wifi at the park. some good History lessons from you. Our new neighbors who will be living in your old house soon – took a break last week to go to Northern Idaho and said it rained the whole time. It sounds like they were there when you were.They said they were happy to come back to sunshine. I hope the sun shines on you soon! We do have sunshine here at Dworshack State Park. Very nice weather but not yet warm enough to think of getting in the water. We miss you too!